Garage doors are complex pieces of equipment that include a large number of moving parts, stressed joints, and powerful mechanisms. As with all types of machinery, these parts will degrade over time depending on how regularly you use the system and how well you look after it. Read on for 3 helpful maintenance practices that you can carry out yourself on a regular basis to prevent needing more expensive repairs in future. This is something that can be done monthly if you have an overhead or rising door. The springs provide the power needed to lift the door up and ease it down again. If the door is unbalanced, it could be that the springs are overstretched or that one is wearing faster than the other. To check the balance of the door, open it half-way. At this point it should be held in place by the springs. If it falls when you let go, or rises, this indicates that it is probably off balance and that the springs need a little bit of attention before they become more damaged. Bear in mind, the checks you can do yourself, but never attempt to handle the springs yourself. They can be dangerous and unpredictable - it's always best to call a professional. You can use a generic metal works lubricant or one suited for outdoor use if you prefer. Go through all the moving metal rotators, chains, and tracks that make up the system, applying a little lubricant to areas where there will be obvious friction over time. This simple process will help keep these areas clear of rust or rapid degradation. Almost all designs will feature garage door rollers somewhere in their structure. These are commonly made from plastic or rubber, which means they degrade quickly but are relatively cheap to replace. Give them a look and listen, the smoother and quieter they work, the better. If they are loud, bumpy or seem to rattle, this can indicate that they need tightening or replacing. 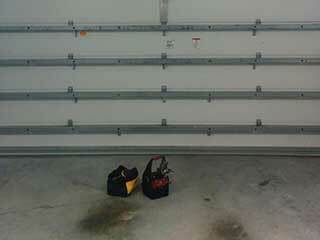 Follow these tips to keep your garage door in good condition. If it's been a while since you've had a professional conduct a service check of your system, click here to contact our experts at Garage Door Repair Murrieta.